Killing lawn weeds is a necessary maintenance task for any homeowner who wants to have a pristine lawn. If weeds are not eradicated, they will choke out the grass and prevent it from growing. Weeds with tiny yellow flowers are black medic, sometimes called yellow clover. They grow horizontally along the surface of the lawn. Getting rid of this weed requires killing off the weeds while simultaneously helping the grass to thrive. 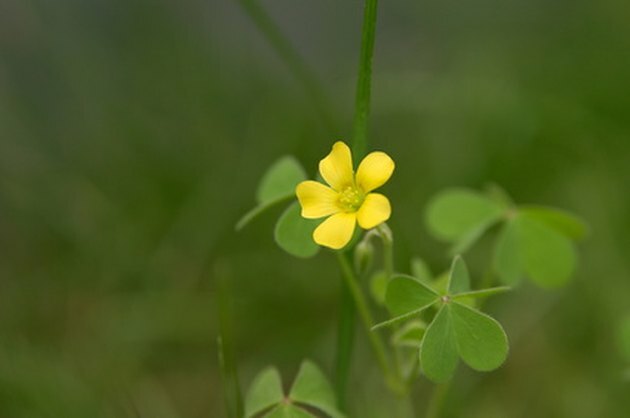 Yellow clover is a pervasive lawn weed. Put on gloves and pull up as much of the yellow clover as possible with your hands. Grasp the weeds close to the surface of the soil, and pull straight up to avoid breaking off the roots. For large infestations, it is impossible to remove all of the weeds, but remove as many as possible. Allow the grass to grow taller than normal. Allowing the grass to grow to approximately 2 inches higher or more means that it will be taller than the weeds, preventing the black medic from getting enough sun. This results in the death of existing weeds and the prevents seeds from sprouting. Water less frequently. Less water causes the grass roots to grow deeper into the soil in search for water. The deeper the roots, the stronger the grass, which means that it can better fight off the growth of yellow clover. Water the grass deeply to 1 inch at a time but wait longer between watering. This allows the top layer of soil to dry out, which kills the weeds, while the grass roots will get water at deeper levels of soil. Apply a high-nitrogen fertilizer to the lawn each spring and fall. Do not fertilize in the summer, as this only benefits the weeds and not the grass. Grass needs a lot of nitrogen to thrive and if weeds are taking over the lawn, it's a sure sign that the soil is deficient in nitrogen.